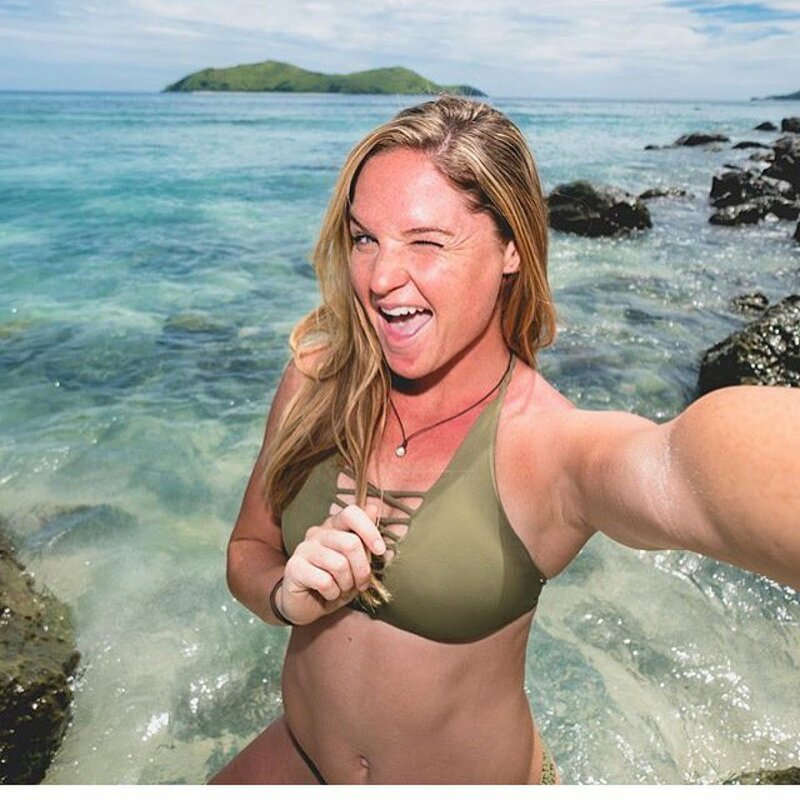 Ashley Nolan was voted out of Survivor: Heroes vs. Healers vs. Hustlers' merged Solewa tribe during the penultimate episode of Season 35 on CBS. Ashley, a 26-year-old lifeguard from Satellite Beach, FL, became the thirteenth person voted out of Survivor and the sixth member of this season's jury on Night 36 of the game through a 5-1 vote at Tribal Council. In a recent exclusive interview with Reality TV World, Ashley talked about her Survivor experience. Below is a portion of what she had to say. Reality TV World: Did you personally try to shadow Ben as he walked around camp looking for a hidden Immunity Idol, and viewers just didn't see it on TV? Ashley Nolan: Well, they did show at that last Tribal Council where [Lauren Rimmer] was voted out, we all come back, and he says he's going to go get water. And it doesn't show anyone following him, but I remember I did follow him. Reality TV World: Chrissy Hofbeck called you out at Tribal on a comment you had made at the Reward Challenge about it being interesting to see who makes the decisions in your tribe. She thought it showed poor sportsmanship, but you said you didn't mean it like that. So could you clarify what you did mean at the time? Ashley Nolan: Yeah, I was like, "Ugh, I see who's making the decisions," and I guess it could've come off sarcastic or smug, but she was saying I meant it a little differently than I did. I don't know, maybe at that point I was just trying to defend myself, but I didn't mean for her to take it that way. I was trying to say, like, if it was just Devon, yeah, he's going to take me for sure. But I understood that it had to be a group decision, and that would not have been wise on Devon's part to be like, "No, we're taking Ashley because she's my alliance." She might have taken it to be literal, like I was being a snooty smartass or something (laughs), but that's not necessarily how I meant it. I might've just been backtracking at that point, like, "No, no, no. You took that wrong, I swear. Don't vote me out, please." Reality TV World: Chrissy was convinced you were gunning for her, but the only evidence she cited was your comment at the Reward Challenge. Were you actually gunning for Chrissy? If not, do you think you said or did something else to give her that impression? Ashley Nolan: I think Chrissy got the impression just based on our lack of communication throughout the entire game, you know? Ever since the merge when she sided with [Ryan Ulrich] and I sided with Devon, we never communicated game-wise for the rest of the time out there, until the loved ones Reward, when she tempted to sway me to come and be with her and Ryan. And I pretty much denied it completely and said, "No." And I think that put a wall between us, and at that point, she had no choice but to not trust me, purely because of lack of communication. And on that, I think it's kind of my fault. Even if I didn't want to vote with them, I should've given her a little bit more to work with as far as manipulating the game and her perspective on where I was at in the game. So I think that's kind of my fault. I think her not trusting me was due to my lack of communication, honestly. Reality TV World: I know Ben was the biggest threat by far. But is there a part of you that wishes you had at least entertained a plan with Ben when he approached you and was trying to talk strategy? I don't know if Mike ever would've gotten onboard, but you possibly could have flipped the game upside down. Ashley Nolan: Yeah. And I look back on that scene when I was kind of snippy with him and I'm like, "No! No one is going to work with you." You get to the Final 6 and that's when you really start thinking, "Okay, do I want to be in the Final 3 or do I want to win?" And so, working with Ben at that point would've been an admission that you just want to get to the Final 3 -- not necessarily win. But in hindsight, sitting in a seat at the Final 3 would've at least given me a platform to voice why I should win. It's better than getting sixth place. But that's hindsight. The ideal vote would've just been him. Take out Ben and then work with whomever I need to work with to get to the Final 3. But yeah, in hindsight, I watched that little clip there and was like, "Oh my gosh, I should've just put down my pride and said, 'Okay Ben, let's do something. You're desperate.'" I just felt so blindly confident in the alliance that I had that I didn't think it was necessary, but that's the game. Reality TV World: Other than Devon, who would have been the other person in your ideal Final 3 if you stuck around longer? And again, that's just me being naive and I kind of like everybody. (Laughs) But, yeah, ideally Mike, because he was such a free agent and he wasn't a part of any votes or any moves or anything. So I think I could easily talk my way over Mike in a Final 3, being like, "Listen, I made way more moves than that guy. He was just wandering around camp blind and just kind of doing whatever he did, and he wasn't a part of any votes." So, I think Mike and Devon would've been an ideal Final 3 for me. To read more from Reality TV World's exclusive Survivor interview with Ashley Nolan, click here and here.